Bani Primary school teachers and the quiz team that came out first. 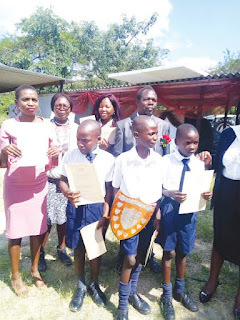 MASVINGO – Bani Primary School from Chiredzi is Masvingo’s Heritage Education Quiz Competition champions after beating six other schools that participated in the event held at the Great Zimbabwe Monuments on Friday last week. The annual competitions which are organised by the National Museums and Monuments of Zimbabwe and sponsored by N Richards Wholesalers are meant to instil in children a spirit that inspires them to value their culture. 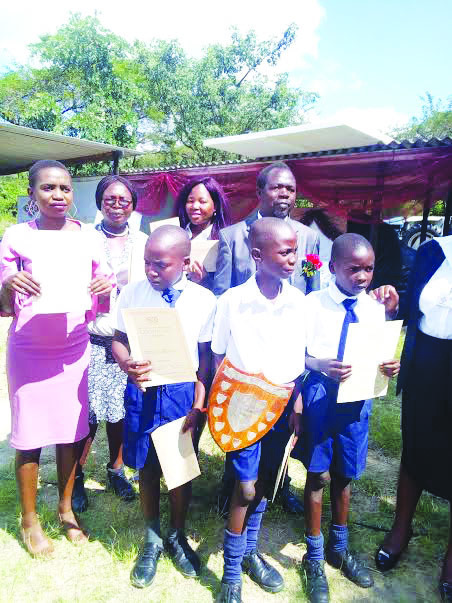 Bani pupils walked away with a floating trophy, $100 for the school and $40 for each of the three pupils who participated in the debate namely; Albert Mutunhu, Tadiwa Tivatyi and Tanaka Machoko. Bani now proceeds to Harare for the national competitions on May 18, 2019. Benson Mutambudzi of Masvingo Teachers’ College who was the guest of honour said education without the foundation of culture and a country without a past is dead. The questions centred on local history, heritage conservation, science and nature and general knowledge. The seven schools that participated on Friday are the winners in their respective seven political districts of Masvingo. Madyangove Primary came second with 31 compared to Bani’s 37 points. Nemamwa which was the champion of last year could only manage a third position this time around with 25 points; Rutenga from Mwenezi came fourth with 23 points, Mutsambwa (Zaka) was number five, Gumindoga (Gutu) came sixth and at the bottom was Mbuyanehanda Primary from Bikita. “People may ask, should we be interested in our past? The National Museums and Monuments preserve the presents and past through collections, research and exhibitions. The past gives us an identity and a nation without a past is dead”, said Mutambudzi. Junior Dzapasi, a teacher who was the Quiz master described the competition as fair and the atmosphere conducive. Dzapasi thanked the Regional director of National Museums and Monuments of Zimbabwe, Lovemore Mandima for the education that they were giving to pupils. Robert Nesvinga Bani Primary coach said these competitions are of importance to the competence based curriculum in helping develop students for a better place as Zimbabweans.